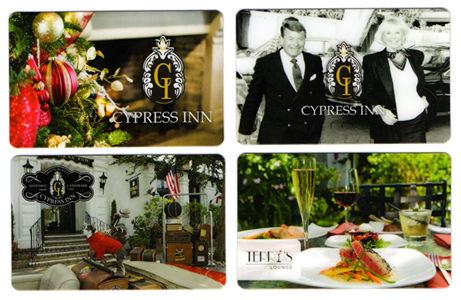 For more than 20 years, Cypress Inn has been jointly owned by legendary singer, actress and animal activist Doris Day and her business partner Dennis LeVett. Doris’s deep devotion to animals helped put Cypress Inn on the map as the “pet friendliest” inn in the “pet friendliest” town in America! 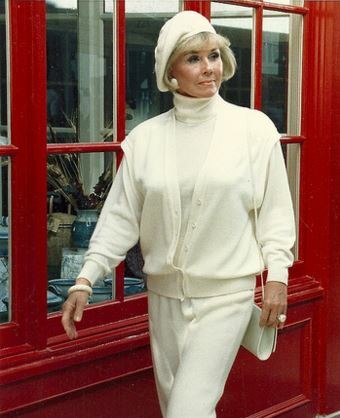 Doris, the quintessential all-American girl, continues to be revered by her fans, while the media still celebrate her as an actress and singer with a legendary Hollywood “girl next door” image. Of her 39 films, Calamity Jane, Love Me or Leave Me and Pillow Talk still remain popular favorites, and run frequently on cable television. Along with her success on the big-screen, Day recorded a series of excellent albums between 1956 and 1968, which only expanded her popularity, and are as relevant today as they were when they were first released. Born Doris Mary Ann von Kappelhoff on April 3, 1922, Doris was the youngest of three: she had two brothers, Richard, who died before she was born, and Paul who was a few years older. She was named after silent movie actress Doris Kenyon, whom her mother admired. Growing up in the 1930s, Doris was drawn to music and dance, eventually forming a dance duo that performed locally until a car she was riding in was struck by a train, crushing her right leg, a severe injury that curtailed her ambition to become a professional dancer. While recovering, her mother encouraged her to take singing lessons from vocal coach Grace Raine. Doris credits Raine with impressing upon her the importance of delivering a lyric, and today Doris says that Raine had the greatest impact on her singing career. Among the many accolades showered on Doris over the years, her leading role in Pillow Talk garnered her a Golden Globe and a Best Actress Nomination and her signature song “Que Sera, Sera” won the Oscar for Best Song for Alfred Hitchcock’s “The Man Who Knew Too Much” in 1956. Doris was voted top Box Office Female Star for four years straight during the early ’60s and was she among the Top 10 for 10 years straight. Her record has never been matched. More recently, Doris received the Presidential Medal of Freedom by George W. Bush in 2004, and was awarded a Grammy for Lifetime Achievement in 2008. Since leaving the Hollywood spotlight more than 30 years ago, Doris has turned her attention to a second career with the same enthusiasm and energy that put her at the top of the entertainment world: the welfare of animals. She has worked tirelessly rescuing, healing and placing thousands of abused or neglected animals. 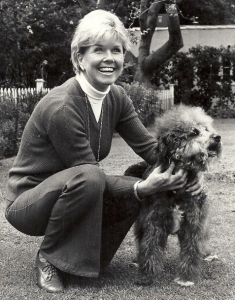 Eventually, she started her own organization: Doris Day Pet Foundation which later became the Doris Day Animal Foundation (http://ddaf.org/dd/). 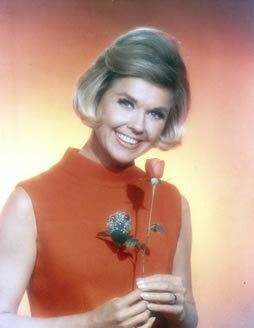 She later initiated the Doris Day Animal League (www.ddal.org). The Doris Day Animal League became a lobbying group on behalf of animal rights and is now a part of the Humane Society of the United States. Doris also had no idea that the Doris Day Animal Foundation would grow into one of the largest animal welfare organizations in the world. The Doris Day Animal Foundation continues to operate under her guidance. Through a veterinarian friend, a beautiful Maltese named Duffy put behind him a life of abuse, neglect and found a home with Doris, who had recently lost her little white dog. Millions of dogs in the United States aren’t as lucky as Duffy Day. Treating their special needs, whether they are medical, behavioral or social, requires a commitment of time and resources far surpassing what humane societies can currently afford. Many animals don’t get the second chance at life they so richly deserve. To spur change, Doris founded the Duffy Day Lifesaving Program, directed at turning our attention to saving senior animals in need medication for the rest of their lives. This will ensure many more happy endings like Duffy’s. Secure donations to Doris’s Foundations can be made at at http://ddaf.org. Today Doris enjoys a quiet life at home in the Carmel Valley, California. She prefers to stay out of the spotlight and instead keeps busy caring for her animals and her beautiful home and grounds, as well as reading and answering hundreds of pieces of fan mail she receives each month. She tends to the affairs of the Doris Day Animal Foundation and has projects ranging from the release of a new CD, a new website (www.dorisday.com) and a paper doll book, and she promises that new ventures are in the works.